Not content with my own YouTube channel, Phoenix and the Dragon, you can now find me chatting writing and magic on the brand new ‘The Witch Lit Podcast’ by Witches-Who-Write, with the fabulous Sheena Cundy. 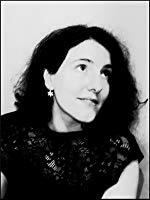 Sheena is from Essex, though we never met when I lived there, but have since become friends, supporting each other with our writing online. 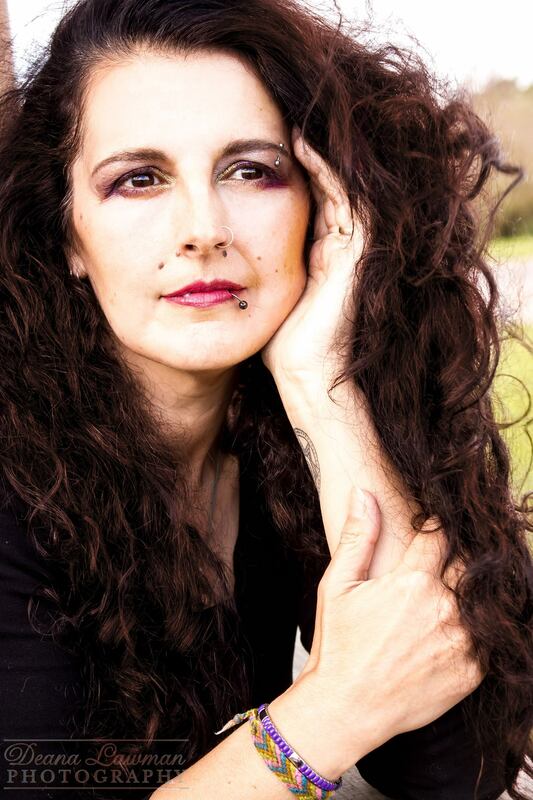 Sheena not only writes Witch Lit, but songs for her band, Morrigan’s Path. In the first episode, we share our writing inspiration and our writing lives, as well as a little of our magical background. If you’re looking for a relaxing, fun podcast, why not tune in? There’s Behind the Broom Cupboard, where we let you into our world of magic, keeping you up to date with our writing and magical work and Witchanory, readings from our magical work and much, much more! Halloween, All Hallow’s Eve or Samhain, is almost upon us. Here’s a short video of my musings about Autumn and this time of year. I wrote this post a year ago but didn’t publish it…Reading it now, I can sense my own disappointment and fear…house on the market but no offers, weeks and months ticking by, feeling like my dream will never be part of my reality….So, I focus on all the positive aspects of my life, the things that make me smile and make me happy and guess what? There’s a happy ending. Every day since 2013 began I’ve tried to remain positive and keep happy whatever life has thrown at me. Some days have tried my patience or rendered me a useless blob as depression clouds my thinking. Other days have been smattered with tiny pockets of happiness, silently crushed by despair in minutes. This month’s new moon received my full attention and I worked on myself, relaxing, calming and revitalising my tired, sluggish chakras and, once full of energy, sending healing to those in need. 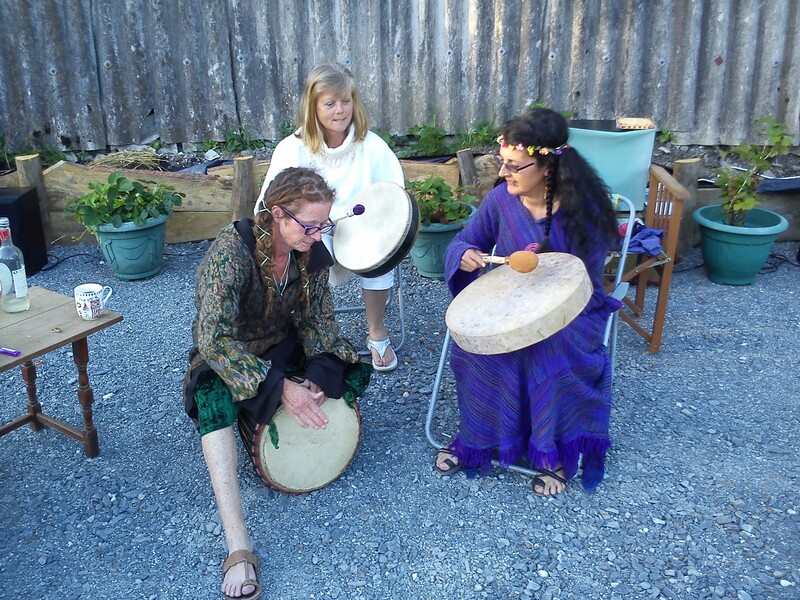 The new moon is a time of creativity and new ideas, it opens doors onto paths unthought of previously. So, pinning the happiness down has been the problem and I’ve been knocked off my path and bombarded with difficulties. Dancing is a great way to be happy and, because I have the support and love of such amazing people, I stay happy when I think of them or receive a text. My children…every time I feel frustrated and restrained from doing what I want to do, I think of the three wonderful human beings I brought into the world who bring joy to my life every day. I may feel my life is in limbo but they continue to grow and blossom into amazing adults. This photo was taken on Mothering Sunday 7 years ago. Friends… I’ve always struggled to make friends but my dancing friends are always there for me. A message from a friend I’ve not heard from in a while is a wonderful boost to my day. My man…. a hug from him will always make me happy. This was taken at Dunwich in May last year. I’m so lucky to have such a supportive partner. My cats…both Tiggy and Ollie pictured here love a good cuddle and a tickle and their contented purring makes me happy too. 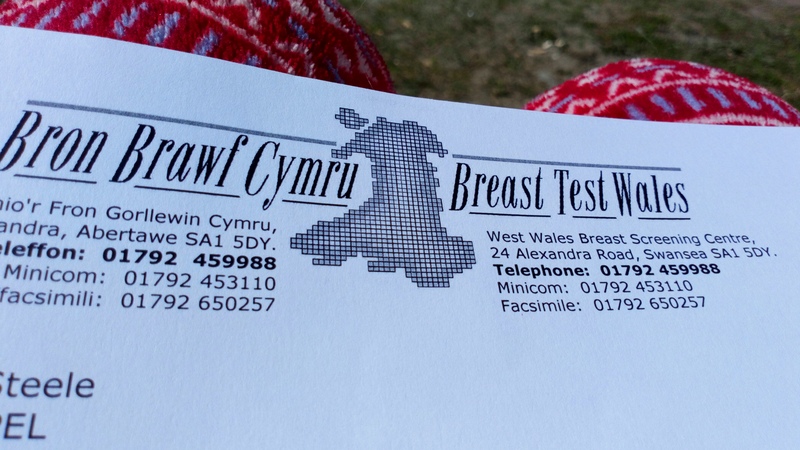 And finally, I’ve dared to look to a brighter future……….in Wales. 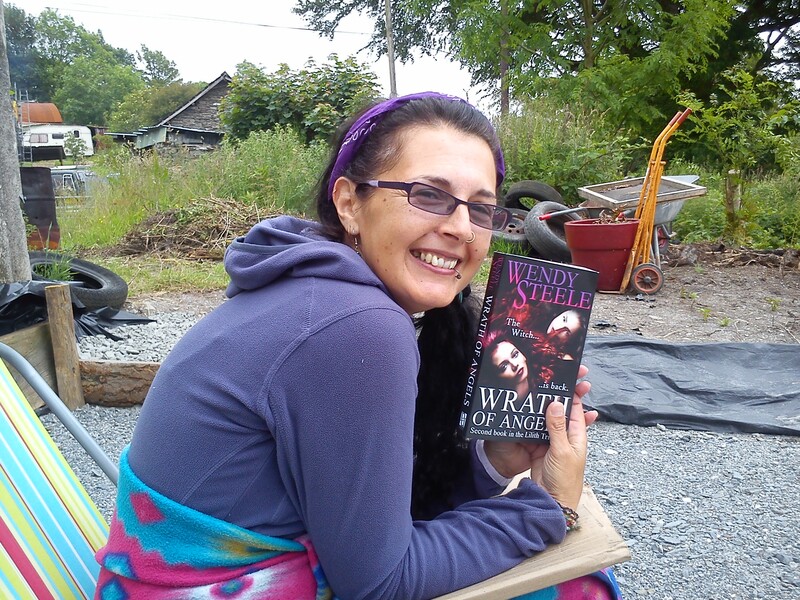 Wrath of Angels is here! It’s been a long time coming, I know, but my second book in the Lilith Trilogy is available in kindle and paperback…I was very excited when the proof arrived………..
After 8 months hard slog at the house and on the land, we decided to hold a Summer Solstice get together for all the lovely people we’ve met since we arrived here, to celebrate the longest day and to say ‘thank you’ for all the kindness and support we’ve received. 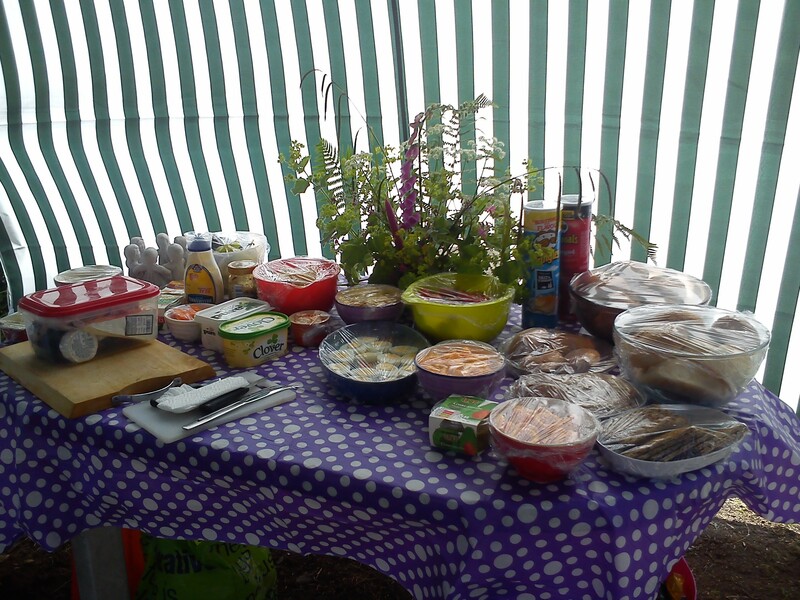 Kind neighbours lent us their gazebo to set up the food and made the floral decorations. Tiggy liked the food tent…..
and the sun shone down on our Welsh decking, only ducking behind the trees late into the afternoon…… As evening fell, with curry warming in the oven, we broke out the drums….. before lighting our Solstice fire and consigning to it all the negativity of the past six months before looking forward to the next exciting months. It’s been a roller coaster at the house….first, we made a bathroom………. 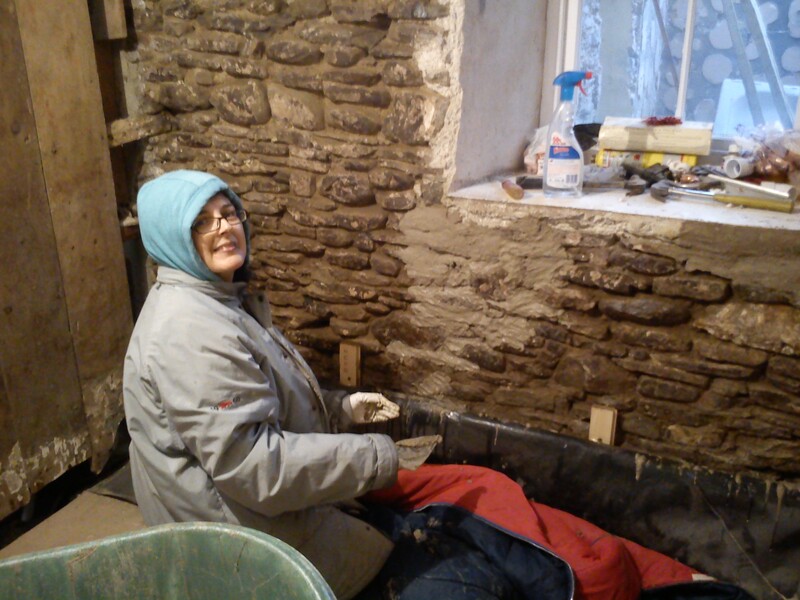 One wall had to be lime mortared, one replaced and one rubbed down before finally……. 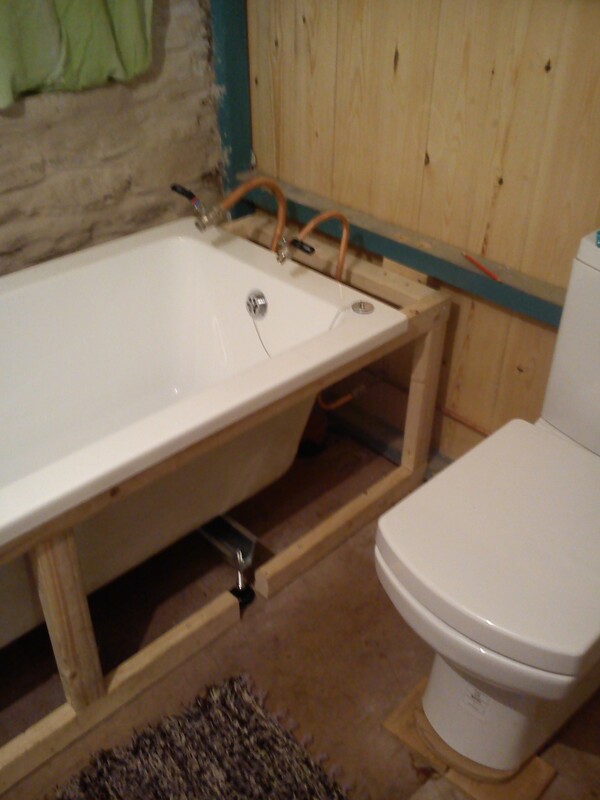 a flushing loo, sink and bath. We made a temporary kitchen………. 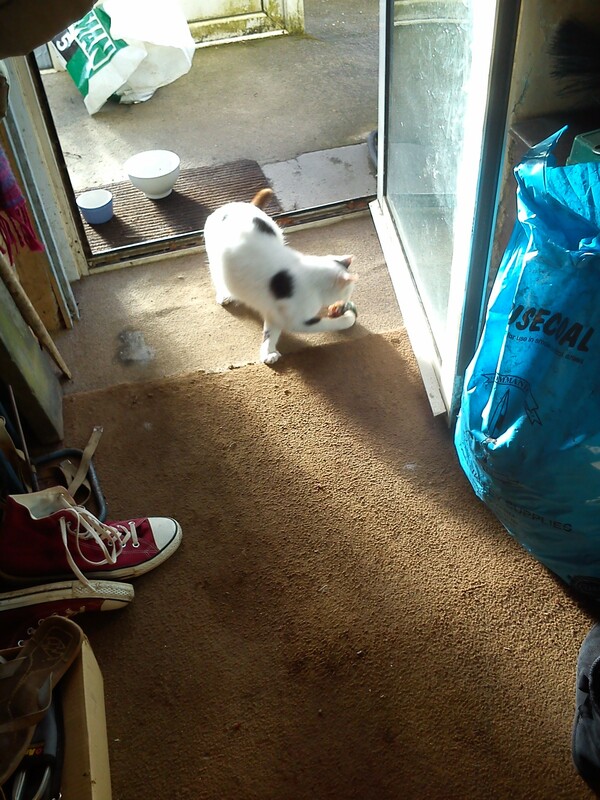 acquired another cat……………. 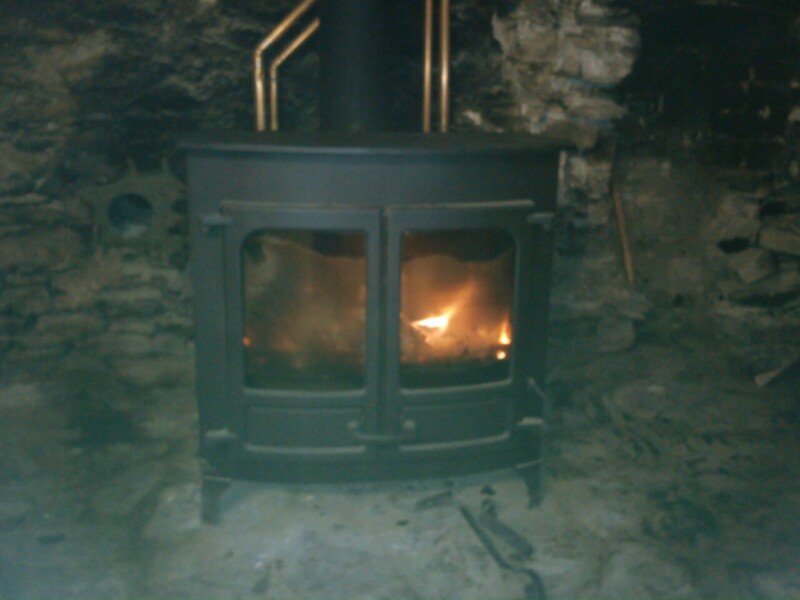 and finally, after much hard work and freezing temperatures, the chimneys were lined and the wood burners went in…….we had heating! 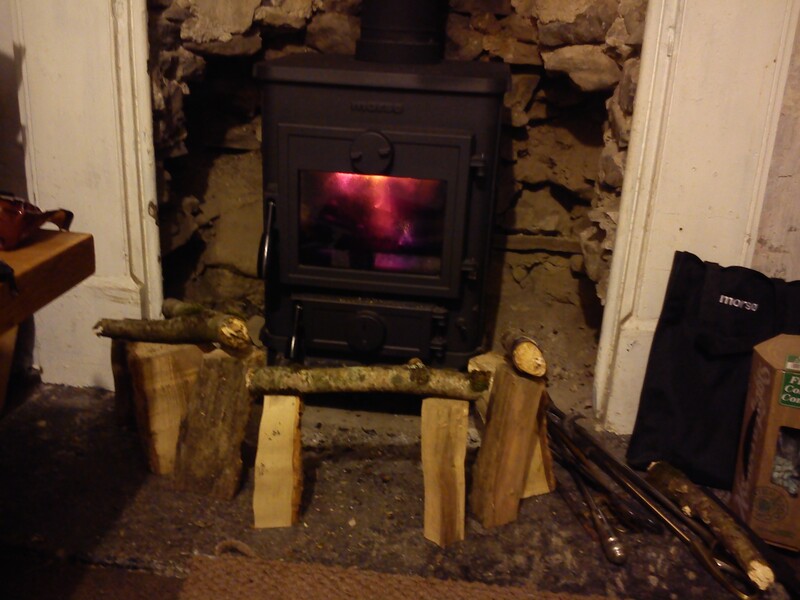 So when the storms hit the country in Feburary 2014, at least we were warm and we’d achieved tent to house heated by our own wood in six months. 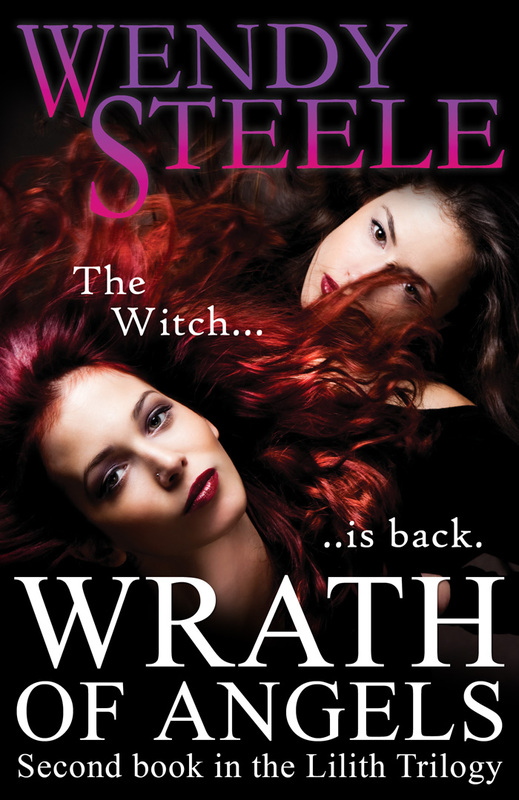 More news to come in the next posting but for now, I leave you with Wrath of Angels…….. 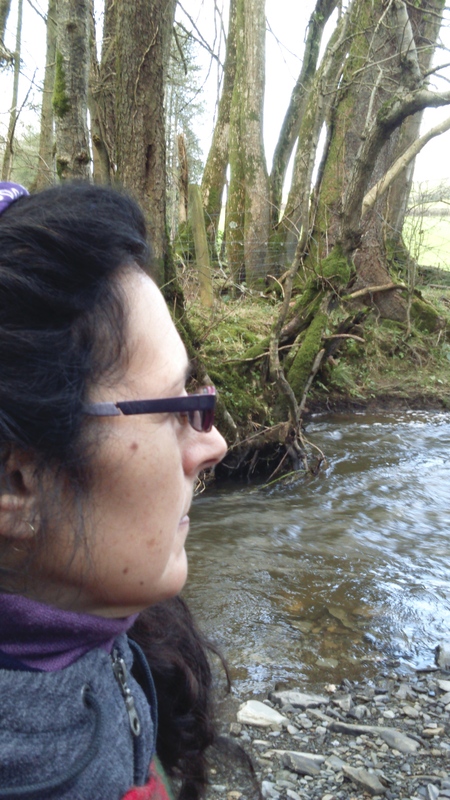 I hope you enjoy the new book and will continue to follow my postings as I settle into my new life in Wales. The mood has been low at the Crazy Cat Camp, very low so yesterday, we went for practical solutions and built a bed off the floor and levelled it out. We’d been sleeping on a 1:6 hill we worked out so, last night was positively luxurious…though we were awake half the night as the rain and wind battered the tent. 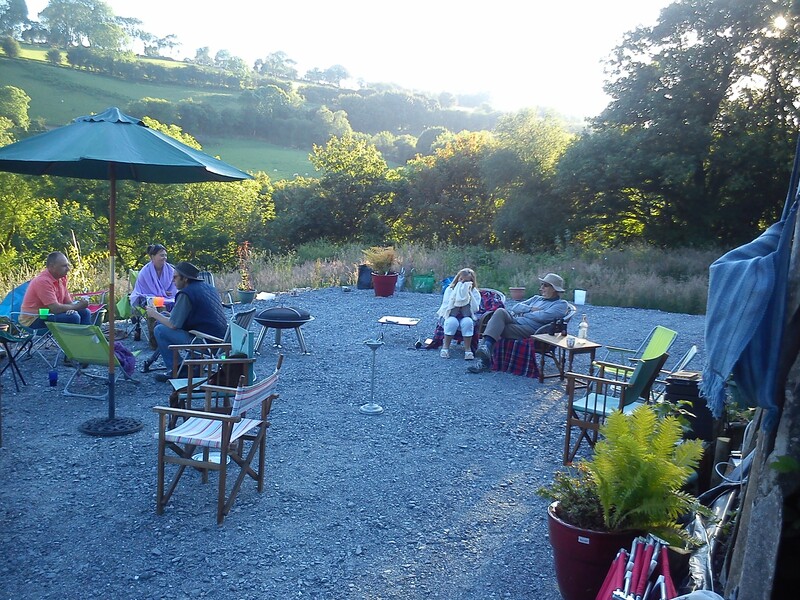 Some evenings are beautiful though and we’ve enjoyed sitting outside until either the rain, cold or insects drive us in. So, we’ve got our sleeping conditions as best as we can and our attentions will be turning to the awning where we are cooking. At the moment, we’ve a double burner on a low table with plastic legs and it’s served us well but it’s buckling. The ground slopes even more than the sleeping tent so Mike wants to lay a floor(!) 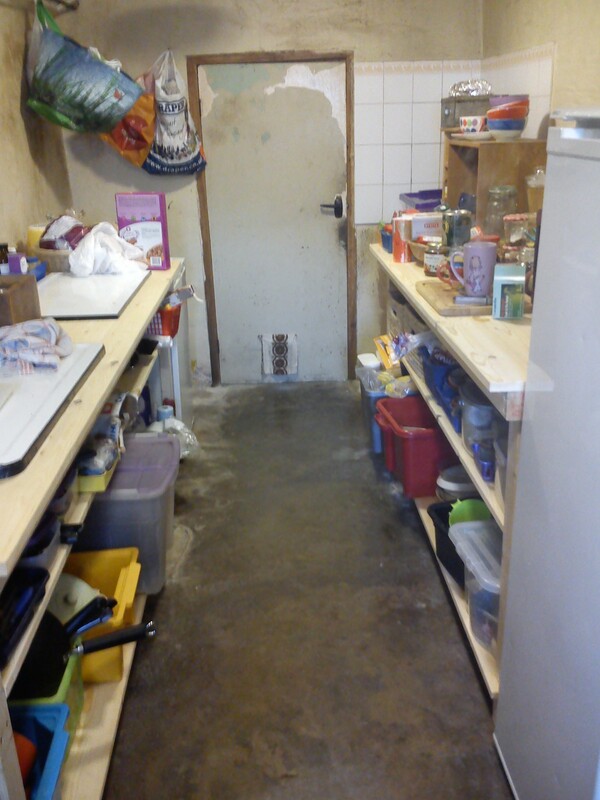 and build some shelving which will accomodate the cooker and the sink. We’ve had lots of one pot meals tarka dahl, stir fry and vegetable curry. I’d bought two jars of curry sauce but we’ve only eaten one and I’m now cooking from scratch, having located a box with some spices in. Keeping food cold is a real problem (a kind neighbour refroze our blocks once but we feel awkward keep asking) so food has to be bought and eaten quickly. Mike’s almost given up on milk in his tea and we’ve abandoned cereal as we can’t get through a pint or a carton of soya milk quick enough. Mike is The Toast King (thank you Lisa and Deana of Tribal Unity for our camping toaster…and replacement) and we have toast with everything. Weight watchers tomato soup has been my saviour while Mike enjoys mushroom while dessert has been restricted to frozen mixed berries with meringues or chocolate. We bought a box of salad today and ate it all for lunch. Meals depend on the weather and how we feel. We adore jacket potatoes and sweetcorn cooked in the fire but, if the wind is too strong, the cinders and ash are blown out of the fire pit and leave nothing to cook on. The photo is of hazelnuts, abundant in the hedgerows but already being scavanged before they are ripe, which is a shame. The blackberries are also beginning to grow, though we munched a couple on a walk the other day and they’re very sour. We’re washing ourselves in a large purple trug and it works quite well though it’s only just possible to sit down in it. The sun needs to be on the tent though or you’re shivering too quickly. I can wash my hair in it too and there’s a clothes line up in the awning which dries towels really well. At the moment, we’re washing up outside and putting clean stuff in the trug before drying…as we’re on a slope, everything slides off the outdoor table and if the wind is blowing, you don’t stand a chance! We’ve been really lucky with the weather through August but now September is here, the evenings are getting colder. The cats are loving snuggling up with us and have been exploring all around the farm, especially Rowan. Everything takes twice as long to do in a tent. We fetch our water from the dairy down by the front barns and the kettle is boiled often and our flasks filled. There’s been many evenings we’ve realised the sun is setting (about 8.30pm here) and we haven’t had dinner…or washed up from lunch so we end up blowing out dinner and having soup and toast instead! Washing ourselves needs even more planning as you need two flasks full and a kettle plus cold water to execute the full works. We’ve found a fabulous shop in Lampeter that does service washes and they wash and dry our clothes and bedding in a day and are very reasonable. I’ve done washing in the trug twice but you need a really hot day to get the clothes dry and jeans were hanging in the awning for days so I’ve given up on that idea. So, what do we do in our tent? If we organise our power, we can get an hour or so on the internet each day, sometimes more so, we can watch an episode of QI, a spot of athletics or I can get online here. We’ve played cards and yahtzee but not scrabble as the cats love to join in. We’ve joined the library and are reading oodles of books. Next time I hope to have uploaded more photos from my new phone and can show you the new bedroom so do join me again. Many apologies for the delay in getting these posts to you but it has taken us a while to balance technology in our field. I’ve powered the laptop up on a trip to and from our nearest town, Lampeter, fifteen minutes away, this morning and the dongle was powered overnight from the car battery. So, we arrived in our field at 8.30pm on Friday 9th August after a six hour journey. We put up our tent and unpacked some of the car so the cats could see what we were doing and at 9.00pm, opened the back door of the car. Three wide eyed cats slowly emerged, ignored the food we’d put down for them and began to explore. Tiggy found a lap to sit on while Olly and Rowan, sniffed and skitted in the grass as new smells and noises bombarded their senses. We were soon off to bed…and the cats joined us. Moving day had been a long one, up at 5.30am to hopefully feed all three cats and get Rowan into Mike’s Mum and Dad’s spare room for the day…we knew Tiggy and Olly would stay close to the house and would come if we called but we knew Rowan wouldn’t so this was the only way to ensure we took all three cats to Wales. The move went well and we would recommend Reliable Removals as they were friendly, fast and efficient. All went smoothly until 1.30pm when a friend arrived, the new owners arrived and we realised how much was still left to pack into the car and clean…and then we had to gather the cats. Our original plans had been altered so we only had one car to pack camping and cats, the removal van not arriving until the following Monday afternoon so it was a bit of a squeeze. The new owners were really patient as we ran around and then attempted to get three cats into the car at the same time. It was stressful but, with hugs and tears from Mike’s Mum and Dad and Dan, Mel and Emmy, we finally set off at 2.30pm. 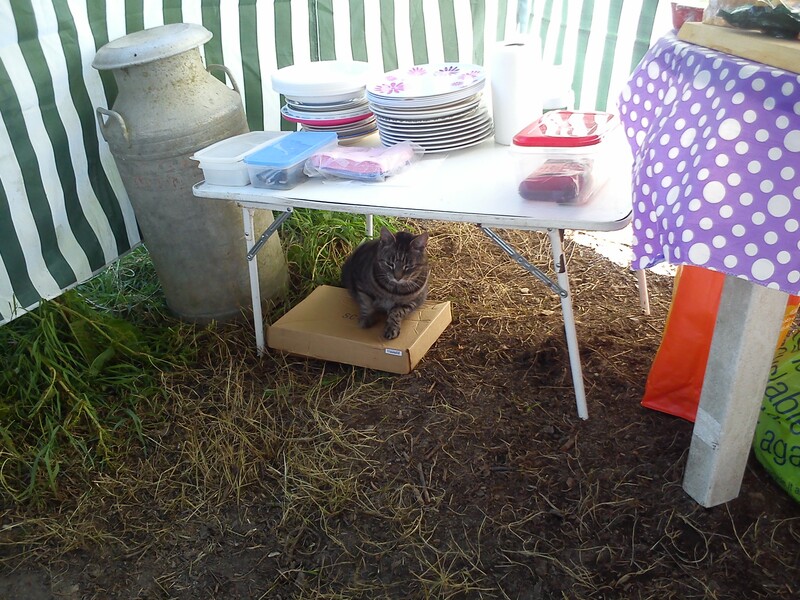 We were so relieved to all arrive in our field but there are some downsides to camping with cats…. A tent is a cat’s playground….this is Tiggy the next morning, attempting to carve out for himself a cat hammock between the two layers of the tent. Cats like to be as high as they can so they will sit on anything. This is Rowan on my coat and Olly on Mike’s guitar. Tiggy thinks he is ‘people’ so even with the whole bed to lie on, he insists on getting up close…and trying to eat our meals. We’ve been feeding the cats first, the opposite of home, in an attempt to eat our meals in peace. We’ve been lucky to eat most outdoors on our laps but a couple of times we’ve had to come in and, because we are effectively on the floor, the cats are bemused as to why our plates, therefore, are not for them. During our first week, Reliable brought up our possessions, my great mate Peter Jones brought my car up and Mike drove him back in his car with a borrowed car trailer, to collect his old Triumph Vitesse and we added to our camp. 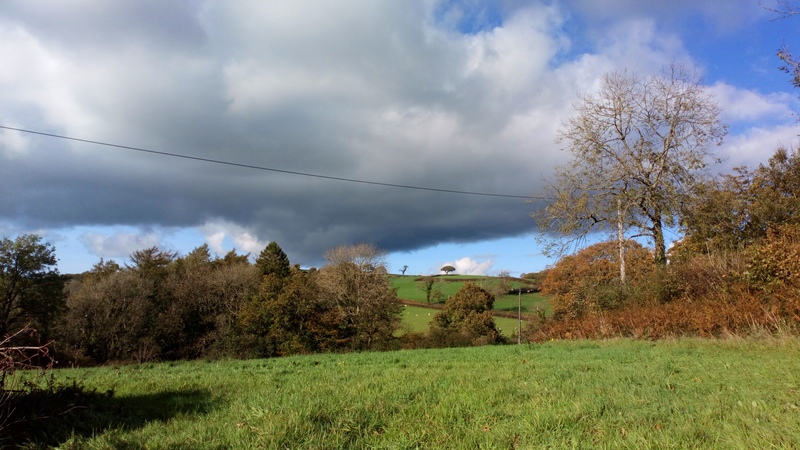 We began with one tent…the house we are buying is to the right of this photo…. …for one day! We had a windy night and the gazebo poles snapped. We were gutted, all our plans gone, but the silver lining is….the poles will make a great frame to put netting over when I start growing soft fruit! So, we’re down to two tents, both holding up to the weather (and cats!) pretty well but what is it really like to try to live in a tent? How does it change the things you normally do? How do your priorities change? Join me again and find out.